Light-sensitive drawings that are usually off view because of their fragile nature. Works that are awaiting conservation or repair. Odd but interesting objects that simply don’t fit any of the Gallery’s storylines. From an Egyptian storage jar dating to before 3400 BCE to a 2003 painting by Rochester artist Carol Acquilano, the rarely seen treasures in It Came from the Vault range across the centuries. 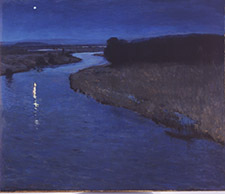 They include works acquired long ago—Eugen Bracht’s painting Morning Star (pictured at left) came into the collection in 1913, the year of the Gallery’s founding—and works acquired in the last decade. The artists represented include a number who played important roles at MAG. Among them (to cite only a few) are Ralph Avery, Peter Berg, Emma Lampert Cooper, E. E. Cummings, George L. Herdle, Robert Marx, John C. Menihan, Luvon Sheppard and Frans Wildenhain. 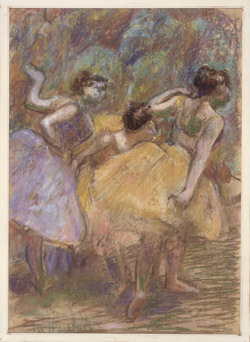 Also on view are works by such major names in art history as Edgar Degas (whose Dancers is pictured at right), Walt Disney, Albrecht Dürer, Helen Frankenthaler, Thomas Gainsborough, Keith Haring, David Hockney, Hans Hofmann, Winslow Homer, Edward Hopper, Paul Klee, Käthe Kollwitz, Fernand Léger, Roy Lichtenstein, Jean-François Millet, Henry Moore, Robert Motherwell, Georgia O’Keeffe, Pablo Picasso, Man Ray, Rembrandt van Rijn, Edward Ruscha, Giovanni Battista Tiepolo, Joyce Treiman and Jerome Witkin.